Exciting things are happening around the old Blockhouse School near Mahone Bay. The 1962 building has been abandoned since the local French Acadian school moved to its new location outside Bridgewater in 2010. 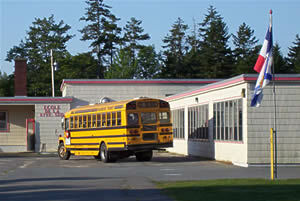 That left the property in the hands of the Municipality of the District of Lunenburg (MODL). Plan B was to bulldoze the property. They were looking for someone with Plan A. A growing group of people has been coming together around a vision – repurpose the building, and show the world how it can be done. Insulate it to its eyeballs and add active and passive solar heating. Use it as a business incubator for projects that will make the area more self-sufficient and sustainable. Plant perennials that will add to our food supply in the long term, and teach people how to do the same. Aquaponics. Permaculture. Green roof. Composting toilets. Time-share commercial kitchen. All these things have been done elsewhere; we just need a model of how to do it here. Check out the new website at TheBlockhouseSchool.org. So Nova Scotia’s ships have finally come in with the announcement that the federal contract for combat ships, worth $25 billion over 30 years, has been awarded to Irving Shipbuilding in Halifax over a Vancouver yard, which received an $8 contract for non-combat ships, and the Davie shipyard in Lévis, Quebec, which lost out. Irving’s job postings are starting to appear in the Chronicle Herald. It’s fantastic news for Nova Scotians. Kudos to the federal government for the impartial procurement process, and to Irving Shipbuilding as well as Premier Darrell Dexter and other proposal partners for their successful bid. The news story leaves me with a couple of questions. Why did the feds make such a big deal about the impartial, non-political procurement process? And why did Irving Shipbuilding and the Nova Scotia government spend $1.4 million on their public relations campaign, Ships Start Here, even though it would have no direct influence on whether Halifax got the contract? I don’t usually comment on political issues in this blog, but the answers I’ve come up with explain a lot about Nova Scotia and its relationship to the rest of Canada. The federal government and the Navy have solid business reasons for wanting to choose the best shipyard for the job. You’d think that would go without saying, but it’s not always how things work in Canada. In 1986, during the Mulroney era, a large team of technical experts recommended that an aircraft maintenance contract for CF-18 fighter jets go to Bristol Aerospace of Winnipeg on account of their superior technology and lower bid. Instead, the contract was awarded to Canadair of Montreal. As well as a poor business decision, the turnaround was a bad political decision. It contributed greatly to widespread disaffection with Canada in the west, the founding of the Reform Party and the demise of the federal Progressive Conservatives. Prime Minister Stephen Harper and Defence Minister Peter MacKay lived this history and don’t want to repeat it, I’m sure. Then there was the submarine maintenance contract, by which the crippled second-hand subs Canada bought to Halifax from Britain (with loss of life) were shipped at great expense to a BC yard with no experience in submarines. No shipyard in the country is currently equipped build the state-of-the-art ships that the Navy wants for the future. Canada will be investing in the capacity of the chosen shipyards. Over the years, this type of federal government investment has contributed greatly to Ontario and Quebec’s prosperity, leaving provinces like Nova Scotia in the dust. No amount of equalization payments can compensate for the resulting discrepancy in industrial capacity and general prosperity. However, Nova Scotia simply does not have enough seats in Parliament to matter when big federal contracts are assigned to meet political goals. And notwithstanding, Nova Scotia does not have to be seduced with such contracts to remain part of Canada. It must have been obvious to everyone – from anyone involved in the shipbuilding industry, to the Navy, to civil servants and politicians – that Halifax Shipyards were “the only guys left standing with a full-fledged, functioning shipyard in the country.” to quote the Chronicle Herald’s Marilla Stephenson. Shipbuilding is in Nova Scotia’s very bones, and symbolized by the image of Bluenose on the Canadian dime. So why was there so much publicity about the process? Halifax Shipyards in the distance. 2008. Because the big contract could not be awarded to Nova Scotia without making a big deal about it being a fair, impartial, non-political process. The Conservatives with their new majority could afford to do the right thing – at least now at the beginning of their mandate. The political fallout is concentrated in Québec, but that’s not Harper’s problem. And it’s mostly going on in French. As far as the federal Conservatives are concerned, the NDP can deal with it. So if Irving and Nova Scotia’s Ships Start Here campaign did not influence the results, as Defence Minister Peter MacKay so generously pointed out, what did the $1.4 million spent on the campaign accomplish? Navy ships sail past HRM The Queen in Halifax Harbour, June 2010. M. Sepulchre photo. 1. Most importantly, without directly influencing the results, the campaign held the feds publicly accountable for keeping the process honest, now and for the length of the contract. Again, this was done with the certain knowledge that Halifax was the best qualified shipyard and would win one of the two contracts available as long as the awards were made fairly. No doubt the memory of the CF-18 maintenance debacle was vivid. This indirect influence was something like insurance. 2. The Ships Start Here campaign let Nova Scotians know that something big was afoot so they would take the news to heart when the time came. It fostered a positive, can-do attitude among Nova Scotians that can only be good for the local economy. Optimism in a time of recession is a powerful thing. The campaign website is full of stories of how the award will impact ordinary people. 3. The campaign attempted to mitigate potential criticism of the award by pointing out that because of subcontracts, the Halifax bid would in fact spread the money across the country more evenly than would any other bid. The website makes such information readily available for media and commentators. 4. Recruitment is be one of the challenges to be met. The campaign served notice to skilled workers across the country that there would soon be jobs for them in Halifax. Many Nova Scotians working away will be able to return home and work here for the rest of their careers. Housing developers, health care managers and other sectors of the local economy are also taking the hint. 5. And of course, as cynics are quick to point out, it raised the profile of NDP Premier Darrell Dexter – and what politician wouldn’t enjoy that? I have no doubt that he personally paid close attention to this file. With his history as a naval officer and the son of a sheet metal worker, seeing this contract awarded to Halifax must be very dear to his heart. The Angus L. McDonald Bridge will be even busier. What did you think of the contract award process? How will the shipbuilding contract affect you? Just wanted to put in a plug for Lunenburg MLA Pam Birdsall and her website. I first saw Pam years ago when we both had booths at the Nova Scotia Designer Crafts Council shows. Pam was a force behind that organization, as well as local business organizations and community groups like Second Story Women’s Centre, all while co-running Birdsall-Worthington Pottery Ltd. and raising a family. Among her other legislative duties, Pam is chairing the committee to set up Arts Nova Scotia. Pam would like her website to bring government and people closer together. Nova Scotia being a small and friendly place, its can happen. Jenny Osburn of the Union St. Café in Berwick has a great new blog, Kitchen Witch – the secret ingredient is love. She’s interesting, funny, and has a great recipe in every post. Don’t just visit her blog, though. Go eat! The restaurant which she started with her mother, sister and aunt a decade ago is still going strong with Jenny at the helm. She comes from a family of great cooks. More than that however; the food is far from your ordinary fare. It is healthy and local, made from scratch, creative and delicious. The Wick Pub next door, part of the same establishment, is home to an open mic Kitchen Party on Friday nights, hosted by Jenny’s dad, singer-songwriter and soundman Don Osburn. It is also a concert venue. All this information can be found on the Union St. Café website. Click to go to Oxfam Canada or to donate. I was the “Dessert Queen” in Mahone Bay on Saturday night, receiving desserts people brought to the Mahone Bay Centre, sticking their names on the bottoms of the pie plates so they’d get them back later, sometimes tasting the desserts to find out what they were and if they contained nuts, slicing up cheesecake, apple strudel and blueberry pie….Nice work if you can get it? It was a benefit for Haiti, to collect money for Oxfam’s Earthquake Emergency Relief Fund. Oxfam has a team in Haiti permanently, so they are well positioned to get aid to people quickly. As we have seen, speed is all important in saving lives and preventing chaos. The little town of Mahone Bay raised $13,600 for Haiti that night. There were soups, chili, wonderful breads, coffee, cider and desserts, all donated by individuals and businesses in the community. There were musicians donating their talents on 2 stages, and craft tables for kids to make things to sell and to send to children in Haiti. 300 people were fed. We wished we could have sent all that food to Haiti, but money travels lighter. It was a terrific community building event, spearheaded and MC’d by Camelia Frieberg of Pollination Project with Valerie Hearder and Bonnie Isabelle (who did a wonderful job coordinating a busy kitchen with at least a dozen volunteers, as I can attest) the South Shore Waldorf School, Indian Point Marine Farms, Boulangerie La Vendéenne, LaHave Bakery, CafeHaus, Rumtopf Farm and many, many local folks who brought in crock pots and stock pots full of delicious chili and hearty soups and stews. Musicians included Shalan Joudrey, Mary Knickle and HodgePodge, Paul Buchanan and Eilidh Campbell, Slow Cooking Cover, Tim Merry, Jamie Junger and friends, the Rhodenizer Family, Tom Haddal and friends, Reid Campbell, The Trips and Russ Winham and Kirk Comstock. You can still donate to Oxfam and have it counted in the tally for the South Shore for Haiti event until Jan. 28. Here’s how: Go to www.oxfam.ca, choose “Haiti Earthquake 2010” and in the Comments section enter “Event: South Shore for Haiti”. Or phone 1-800-466-9326 and ask them to note that it is for “Event: South Shore for Haiti”. Here is an organization I’m proud and happy to have joined – the Nova Scotia chapter of the Business Alliance for Local Living Economies. Which makes me wonder, as a web designer, what is my contribution to a local, sustainable green economy? Hmm… well, there’s the commute. Most of the time, I just head downstairs to my home office. No greenhouse gasses are generated. As the downstairs is heated with a radiant floor, it’s the warmest part of the house in winter. So that’s very efficient, but doesn’t quite qualify me as a green business – at least not until we get the planned solar panels up on the roof! More to the point, however, my clients tend to be folks who operate independent, small (often micro) Nova Scotian businesses. They live and work here by choice, as do many Nova Scotians. It’s not always an easy choice. By running a successful business, however, they are helping others to live and work here as well. I’m happy to be part of that, and strive to contribute to their success. Some are in tourism, some are artists and craftspeople, some are lawyers and some are builders of log and timber frame homes. The timber framers in particular are quite aware that they add value to the forest simply by using wood for something more enduring than pulp fibre. Hardwoods such as oak and elm are prized by builders and their clients, as are large softwood trees such as pine. The companies that drive the clearcutting of the forests would rather eliminate the hardwoods with herbicides and harvest the faster-growing softwood trees for pulp. 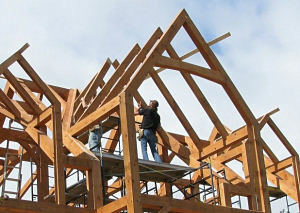 Timber frame homes are built to last a long time. Their interiors are a celebration of the beauty of wood and craftsmanship. They are usually enclosed with energy-efficient materials. So they provide enduring value on many levels and make a solid contribution to the local living economy. A visit to the Nova Scotia Museum of Industry in Stellarton made me realize how self-sufficient Nova Scotia used to be, from the growing of food to the manufacture of automobiles! It is a direction we need to move towards again. The reasons are both environmental and economic. A secure, local food supply and lower greenhouse gas emissions are part of it. And by supporting local businesses, we keep more money circulating in the local economy, and we all benefit. So kudos to the people who started up BALLE-Nova Scotia for getting the balle rolling! A friend just put together this video about “The Story of Maple Syrup”. I contributed a particular photo at the end of the video. A note: the light amber grade of maple syrup may be considered the finest, but I prefer the darker stuff – more flavour, and no doubt more of those nutritious minerals they mention. First sign of spring: maple syrup! Just about the most authentic, old-fashioned maple syrup operation you could ever find is Mountain Maple in the Annapolis Valley, just outside of Wolfville. Perry and Judi Munro are typical of Nova Scotian back-to-the-landers in that they decide first that they want to live here, and then figure out how they’re going to make a living, and they don’t get too specialized. Besides the maple syrup operation, they make art, sculpture, baskets, they guide hunters and fishers and have a vacation rental on the lake. Check out this video, then visit Perry Munro’s website to see what all they’re up to. The Candy Fairy is coming on Halloween!